On these beautiful cycling routes, cyclists can explore the Zurich region in an active way. 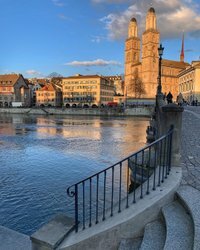 Through the urban metropolis of Zurich, along the shores of deep-blue lakes, or through dense forests: Zurich is perfect for exploring by bicycle. 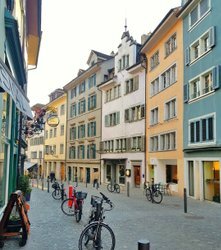 These cycling routes are of different lengths and levels of difficulty, and lead from Zurich to the history-steeped Canton of Schwyz, to the imposing Rhine Falls near the German border, or to the picturesque Town of Roses, Rapperswil. The paths are well signposted with a blue logo on a red background bearing a bicycle symbol. 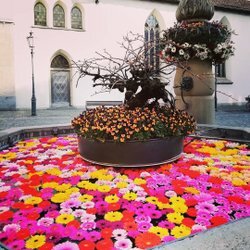 This cycle tour takes you in two stages from Rapperswil to the spa town of Baden. This steep and high cycling route is not for weak calves and faltering hearts. This route leads by bicycle in three stages from the Rhine through Zurich to the Linth Canal. The trail leads from Glattfelden to Rapperswil through idyllic scenery yet close to urban Zurich. This cycle tour leads through fields, vineyards and past the town of Winterthur as far as Rapperswil. A pilgrimage on a bike? Not a problem on this route. This picturesque cycle route leads from the Rhine Falls into the Zurich Oberland and on to Wattwil. This cycling tour leads from the urban Limmattal into the historical heart of Switzerland.